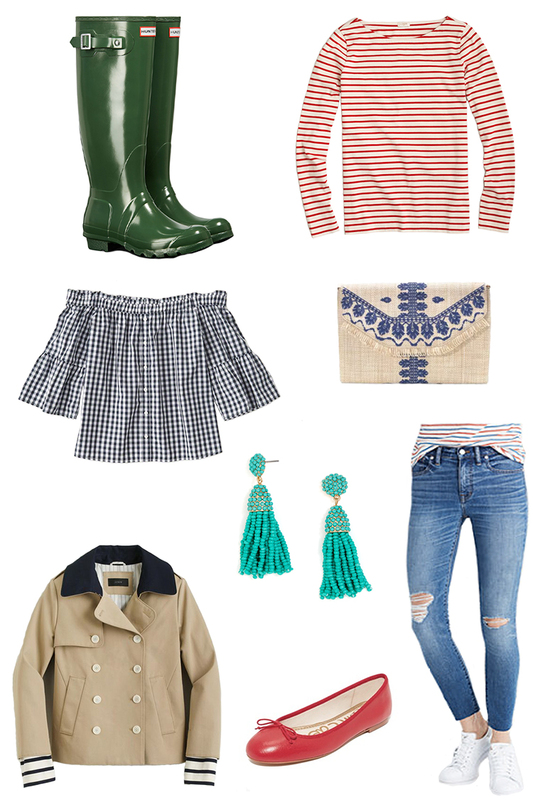 I just came back from NYC where I got a taste of spring weather, which got me excited to replace my wool sweaters with cotton shirts, flats, light wash denim, gingham, and seersucker. I did a bit of shopping there and surprisingly didn't go overboard (as my family expected me to). I picked up this off the shoulder top in gingham, from Abercrombie of all places. I haven't bought anything there since high school but I was pleasantly surprised by their selection. The top is SO cute and I know that I will wear it a ton this spring and summer. I also ventured into Century 21 and found a great pair of distressed jeans from Paige. I think the distressed jeans from Madewell, pictured above, also also a good option, since the distressing is minimal. For spring, I also have my eye on a pair of red flats. I realized that red would go great with all of my navy and blue tops. Sam Edelman recently came out with a new style of flats called the "Finley", which I'm a big fan of. They're more structured than their classic Felicia flats and also don't have the embroidered SE at the back of the heel. Despite the fact that spring is quickly approaching, it has been pretty cold and windy lately, so I've been diligent about sticking to my skin care routine. 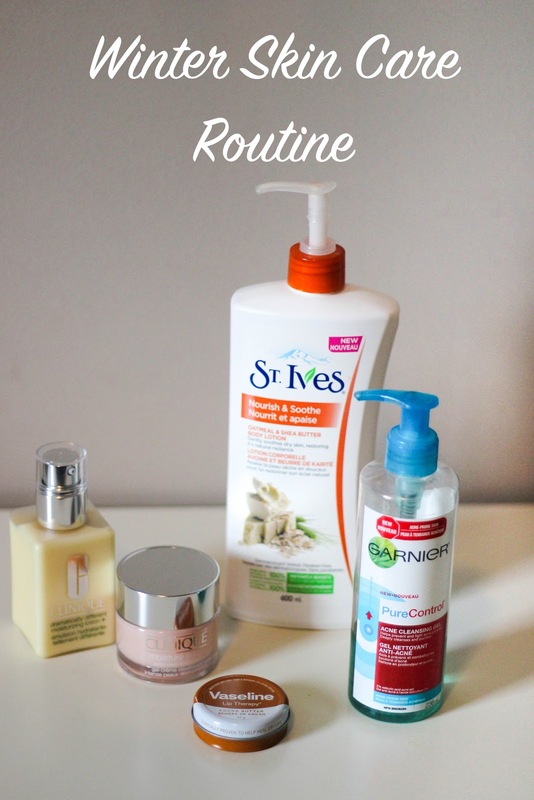 Here are my must-haves for winter! I have dry-combination, acne-prone skin so I've had to find a balance between products that prevent acne but don't dry out my skin. Evening morning and night, I wash my face with Garnier's PureControl Acne Cleanser which is great for preventing blemishes without being too drying. I actually find it more effective than a similar (more expensive) product from Clinique! My cheeks tend to get quite dry, so in that area I use Clinique's Dramatically Different Moisturizing Lotion+. This stuff works wonders! I used to get patchy, dry rashes on my face during the winter and that stopped once I tried this moisturizer. On my t-zone I apply Clinique's Moisture Surge Extended Thirst Relief, which is oil-free, so it won't clog pores. Clinique moisturizers are a little pricy but I can't recommend them enough. Regular chapsticks don't cut it for me, so I use Vaseline which works MIRACLES. I forgot to bring Vaseline with me when I went skiing in December and my lips were insanely dry and painful. When I finally got to a drug store, I didn't want to buy a massive tub of Vaseline (there was 0 space in my suitcase, oops) so I got the Lip Therapy in Cocoa Butter which smells amazing and fits in to a clutch. St. Ives Nourish and Soothe Oatmeal and Shea Butter Body Lotion is great because it's moisturizing, but not greasy. It also leaves you smelling like a oatmeal muffins.